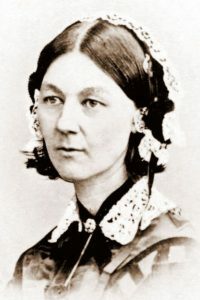 Florence Nightingale , OM, RRC (12 May 1820 – 13 August 1910) was a celebrated English social reformer and statistician, and the founder of modern nursing. She came to prominence while serving as a nurse during the Crimean War, where she tended to wounded soldiers. She was dubbed “The Lady with the Lamp” after her habit of making rounds at night. Early 21st century commentators have asserted Nightingale’s achievements in the Crimean War had been exaggerated by the media at the time, to satisfy the public’s need for a hero. But her later achievements remain widely accepted. In 1860, Nightingale laid the foundation of professional nursing with the establishment of her nursing school at St Thomas’ Hospital in London. It was the first secular nursing school in the world, now part of King’s College London. The Nightingale Pledge taken by new nurses was named in her honour, and the annual International Nurses Day is celebrated around the world on her birthday. Her social reforms include improving healthcare for all sections of British society; improving healthcare and advocating for better hunger relief in India; helping to abolish laws regulating prostitution that were overly harsh to women; and expanding the acceptable forms of female participation in the workforce. Nightingale was a prodigious and versatile writer. In her lifetime much of her published work was concerned with spreading medical knowledge. Some of her tracts were written in simple English so they could easily be understood by those with poor literary skills. She helped popularize the graphical presentation of statistical data. Much of her writing, including her extensive work on religion and mysticism, has only been published posthumously. Nightingale was born to a wealthy upper-class family, at a time when women of her class were expected to focus on marriage and child bearing. Unitarian religious inspiration led her to devote her life to serving others, both directly and as a reformer. Nightingale rejected proposals of marriage so as to be free to pursue her calling. Her father had progressive social views, providing his daughter with a well-rounded education that included mathematics and supported her desire to lead an active life. Nightingale’s ability to effect reform rested on her exceptional analytic skills, her high reputation, and her network of influential friends. Starting in her mid thirties, she suffered from chronic poor health, but continued working almost until her death at the age of ninety. Florence Nightingale was born into a rich, upper-class, well-connected British family at the Villa Colombaia, near the Porta Romana at Bellosguardo in Florence, Italy, and was named after the city of her birth. Florence’s older sister Frances Parthenope had similarly been named after her place of birth, Parthenopolis, a Greek settlement now part of the city of Naples. The family moved back to England in 1821, with Nightingale being brought up in the family’s homes at Embley and Lea Hurst. Her parents were William Edward Nightingale, born William Edward Shore (1794–1874) and Frances (“Fanny”) Nightingale née Smith (1789–1880). William’s mother Mary née Evans was the niece of one Peter Nightingale, under the terms of whose will William inherited his estate at Lea Hurst in Derbyshire, and assumed the name and arms of Nightingale. Fanny’s father (Florence’s maternal grandfather) was the abolitionist and Unitarian William Smith. Nightingale was educated mainly by her father. Nightingale underwent the first of several experiences that she believed were calls from God in February 1837 while at Embley Park, prompting a strong desire to devote her life to the service of others. In her youth she was respectful of her family’s opposition to her working as nurse, only announcing her decision to enter the field in 1844. Despite the intense anger and distress of her mother and sister, she rebelled against the expected role for a woman of her status to become a wife and mother. Nightingale worked hard to educate herself in the art and science of nursing, in spite of opposition from her family and the restrictive social code for affluent young English women. As a young woman Nightingale was attractive, slender and graceful. While her demeanor was often severe, she could be very charming and her smile was radiant. Her most persistent suitor was the politician and poet Richard Monckton Milnes, 1st Baron Houghton, but after a nine-year courtship she rejected him, convinced that marriage would interfere with her ability to follow her calling to nursing. In Rome in 1847, she met Sidney Herbert, a politician who had been Secretary at War (1845–1846). Herbert was on his honeymoon; he and Nightingale became lifelong close friends. Herbert would be Secretary of War again during the Crimean War; he and his wife were instrumental in facilitating Nightingale’s nursing work in the Crimea. She became a key adviser to him in his political career, though she was accused by some of having hastened Herbert’s death from Bright’s Disease in 1861 because of the pressure her programme of reform placed on him. Nightingale also much later had strong relations with Benjamin Jowett, who may have wanted to marry her. At Thebes she wrote of being “called to God” while a week later near Cairo she wrote in her diary (as distinct from her far longer letters that her elder sister Parthenope was to print after her return): “God called me in the morning and asked me would I do good for him alone without reputation.” Later in 1850, she visited the Lutheran religious community at Kaiserswerth-am-Rhein in Germany, where she observed Pastor Theodor Fliedner and the deaconesses working for the sick and the deprived. She regarded the experience as a turning point in her life, and issued her findings anonymously in 1851; The Institution of Kaiserswerth on the Rhine, for the Practical Training of Deaconesses, etc. was her first published work; she also received four months of medical training at the institute which formed the basis for her later care. Florence Nightingale’s most famous contribution came during the Crimean War, which became her central focus when reports got back to Britain about the horrific conditions for the wounded. On 21 October 1854, she and the staff of 38 women volunteer nurses that she trained, including her aunt Mai Smith, were sent (under the authorisation of Sidney Herbert) to the Ottoman Empire. They were deployed about 295 nautical miles (546 km; 339 mi) across the Black Sea from Balaklava in the Crimea, where the main British camp was based. After Nightingale sent a plea to The Times for a government solution to the poor condition of the facilities, the British Government commissioned Isambard Kingdom Brunel to design a prefabricated hospital which could be built in England and shipped to the Dardanelles. The result was Renkioi Hospital, a civilian facility which under the management of Dr. Edmund Alexander Parkes had a death rate less than 1/10th that of Scutari. The first edition of the Dictionary of National Biography (1911) asserted that Nightingale reduced the death rate from 42% to 2% either by making improvements in hygiene herself or by calling for the Sanitary Commission. However, death rates actually began to rise to the highest of all hospitals in the region. During her first winter at Scutari, 4,077 soldiers died there. Ten times more soldiers died from illnesses such as typhus, typhoid, cholera and dysentery than from battle wounds. With overcrowding, defective sewers and lack of ventilation, the Sanitary Commission had to be sent out by the British government to Scutari in March 1855, almost six months after Florence Nightingale had arrived. The commission flushed out the sewers and improved ventilation. Death rates were sharply reduced, but she did not recognise hygiene as the predominant cause of death at the time and never claimed credit for helping to reduce the death rate. In 2001 and 2008 the BBC released documentaries which were critical of Nightingale’s performance in the Crimean War, as were some follow-up articles published in The Guardian and the Sunday Times. Nightingale scholar L. McDonald has dismissed these criticisms as “often preposterous”, arguing they are not supported by the primary sources. Nightingale still believed that the death rates were due to poor nutrition, lack of supplies and overworking of the soldiers. After she returned to Britain and began collecting evidence before the Royal Commission on the Health of the Army, she came to believe that most of the soldiers at the hospital were killed by poor living conditions. This experience influenced her later career, when she advocated sanitary living conditions as of great importance. Consequently, she reduced peacetime deaths in the army and turned attention to the sanitary design of hospitals. In the Crimea on 29 November 1855, the Nightingale Fund was established for the training of nurses during a public meeting to recognize Nightingale for her work in the war. There was an outpouring of generous donations. Sidney Herbert served as honourary secretary of the fund and the Duke of Cambridge was chairman. Nightingale was considered a pioneer in the concept of medical tourism as well, based on her 1856 letters describing spas in the Ottoman Empire. She detailed the health conditions, physical descriptions, dietary information, and other vital details of patients whom she directed there. The treatment there was significantly less expensive than in Switzerland. Nightingale had £45,000 at her disposal from the Nightingale Fund to set up the Nightingale Training School at St. Thomas’ Hospital on 9 July 1860. The first trained Nightingale nurses began work on 16 May 1865 at the Liverpool Workhouse Infirmary. Now called the Florence Nightingale School of Nursing and Midwifery, the school is part of King’s College London. She also campaigned and raised funds for the Royal Buckinghamshire Hospital in Aylesbury near her family home. Nightingale wrote Notes on Nursing (1859). The book served as the cornerstone of the curriculum at the Nightingale School and other nursing schools, though it was written specifically for the education of those nursing at home. Nightingale wrote “Every day sanitary knowledge, or the knowledge of nursing, or in other words, of how to put the constitution in such a state as that it will have no disease, or that it can recover from disease, takes a higher place. It is recognised as the knowledge which every one ought to have – distinct from medical knowledge, which only a profession can have”. Notes on Nursing also sold well to the general reading public and is considered a classic introduction to nursing. Nightingale spent the rest of her life promoting and organizing the nursing profession. In the introduction to the 1974 edition, Joan Quixley of the Nightingale School of Nursing wrote: “The book was the first of its kind ever to be written. It appeared at a time when the simple rules of health were only beginning to be known, when its topics were of vital importance not only for the well-being and recovery of patients, when hospitals were riddled with infection, when nurses were still mainly regarded as ignorant, uneducated persons. The book has, inevitably, its place in the history of nursing, for it was written by the founder of modern nursing”. As Mark Bostridge has recently demonstrated, one of Nightingale’s signal achievements was the introduction of trained nurses into the workhouse system in England and Ireland from the 1860s onwards. This meant that sick paupers were no longer being cared for by other, able-bodied paupers, but by properly trained nursing staff. Though Nightingale is sometimes said to have denied the theory of infection for her entire life, a recent biography disagrees, saying that she was simply opposed to a precursor of germ theory known as “contagionism”. This theory held that diseases could only be transmitted by touch. Before the experiments of the mid-1860s by Pasteur and Lister, hardly anyone took germ theory seriously; even afterwards, many medical practitioners were unconvinced. Bostridge points out that in the early 1880s Nightingale wrote an article for a textbook in which she advocated strict precautions designed, she said, to kill germs. Nightingale’s work served as an inspiration for nurses in the American Civil War. The Union government approached her for advice in organizing field medicine. Although her ideas met official resistance, they inspired the volunteer body of the United States Sanitary Commission. By 1882, several Nightingale nurses had become matrons at several leading hospitals, including, in London (St Mary’s Hospital, Westminster Hospital, St Marylebone Workhouse Infirmary and the Hospital for Incurables at Putney) and throughout Britain (Royal Victoria Hospital, Netley; Edinburgh Royal Infirmary; Cumberland Infirmary and Liverpool Royal Infirmary), as well as at Sydney Hospital in New South Wales, Australia. From 1857 onwards, Nightingale was intermittently bedridden and suffered from depression. A recent biography cites brucellosis and associated spondylitis as the cause. An alternative explanation for her depression is based on her discovery after the war that she had been mistaken about the reasons for the high death rate. There is, however, no documentary evidence to support this theory. Most authorities today accept that Nightingale suffered from a particularly extreme form of brucellosis, the effects of which only began to lift in the early 1880s. Despite her symptoms, she remained phenomenally productive in social reform. During her bedridden years, she also did pioneering work in the field of hospital planning, and her work propagated quickly across Britain and the world. Nightingale output slowed down considerably in her last decade, she now wrote very little due to blindness and declining mental abilities, though she still retained an interest in current affairs. Although much of Nightingale’s work improved the lot of women everywhere, Nightingale was of the opinion that women craved sympathy and were not as capable as men. She criticized early women’s rights activists for decrying an alleged lack of careers for women at the same time that lucrative medical positions, under the supervision of Nightingale and others, went perpetually unfilled. She preferred the friendship of powerful men, insisting they had done more than women to help her attain her goals, writing, “I have never found one woman who has altered her life by one iota for me or my opinions.” She often referred to herself in the masculine, as for example “a man of action” and “a man of business”. She did, however, have several important and passionate friendships with women. Later in life she kept up a prolonged correspondence with Irish nun Sister Mary Clare Moore, with whom she had worked in Crimea. Her most beloved confidante was Mary Clarke, an Englishwoman she met in 1837 and kept in touch with throughout her life. In spite of these deep emotional attachments to women, some scholars of Nightingale’s life believe that she remained chaste for her entire life; perhaps because she felt a religious calling to her career, or because she lived in the time of Victorian sexual morality. Indeed, Nightingale is described as “a true pioneer in the graphical representation of statistics”, and is credited with developing a form of the pie chart now known as the polar area diagram, or occasionally the Nightingale rose diagram, equivalent to a modern circular histogram, in order to illustrate seasonal sources of patient mortality in the military field hospital she managed. Nightingale called a compilation of such diagrams a “coxcomb”, but later that term would frequently be used for the individual diagrams. She made extensive use of coxcombs to present reports on the nature and magnitude of the conditions of medical care in the Crimean War to Members of Parliament and civil servants who would have been unlikely to read or understand traditional statistical reports. In her later life Nightingale made a comprehensive statistical study of sanitation in Indian rural life and was the leading figure in the introduction of improved medical care and public health service in India. In 1858 and 1859 she successfully lobbied for the establishment of a Royal Commission into the Indian situation. Two years later she provided a report to the commission, which completed its own study in 1863. “After 10 years of sanitary reform, in 1873, Nightingale reported that mortality among the soldiers in India had declined from 69 to 18 per 1,000”. In 1859 Nightingale was elected the first female member of the Royal Statistical Society and she later became an honorary member of the American Statistical Association. Nightingale’s achievements are all the more impressive when they are considered against the background of social restraints on women in Victorian England. Her father, William Edward Nightingale, was an extremely wealthy landowner, and the family moved in the highest circles of English society. In those days, women of Nightingale’s class did not attend universities and did not pursue professional careers; their purpose in life was to marry and bear children. Nightingale was fortunate. Her father believed women should be educated, and he personally taught her Italian, Latin, Greek, philosophy, history and – most unusual of all for women of the time – writing and mathematics. While better known for her contributions in the nursing and mathematical fields, Nightingale is also an important link in the study of English feminism. During 1850 and 1852, she was struggling with her self-definition and the expectations of an upper-class marriage from her family. As she sorted out her thoughts, she wrote Suggestions for Thought to Searchers after Religious Truth. This was an 829 page, three-volume work, which Nightingale had printed privately in 1860, but which until recently was never published in its entirety. An effort to correct this was made with a 2008 publication by Wilfrid Laurier University, as volume 11 of a 16 volume project, the Collected Works of Florence Nightingale. The best known of these essays, called Cassandra, was previously published by Ray Strachey in 1928. Strachey included it in The Cause, a history of the women’s movement. Apparently, the writing served its original purpose of sorting out thoughts; Nightingale left soon after to train at the Institute for deaconesses at Kaiserswerth. The first official nurses’ training programme, the Nightingale School for Nurses, opened in 1860. The mission of the school was to train nurses to work in hospitals, to work with the poor and to teach. This intended that students cared for people in their homes, an appreciation that is still advancing in reputation and professional opportunity for nurses today. Florence Nightingale’s lasting contribution has been her role in founding the modern nursing profession. She set an example of compassion, commitment to patient care and diligent and thoughtful hospital administration. In addition to the continued operation of the Florence Nightingale School of Nursing and Midwifery at King’s College London, The Nightingale Building in the School of Nursing and Midwifery at the University of Southampton is also named after her. International Nurses Day is celebrated on her birthday each year. The Florence Nightingale Declaration Campaign, established by nursing leaders throughout the world through the Nightingale Initiative for Global Health (NIGH), aims to build a global grassroots movement to achieve two United Nations Resolutions for adoption by the UN General Assembly of 2008. They will declare: The International Year of the Nurse–2010 (the centennial of Nightingale’s death); The UN Decade for a Healthy World–2011 to 2020 (the bicentennial of Nightingale’s birth). NIGH also works to rekindle awareness about the important issues highlighted by Florence Nightingale, such as preventive medicine and holistic health. So far, the Florence Nightingale Declaration has been signed by over 18,500 signatories from 86 countries. During the Vietnam War, Nightingale inspired many U.S. Army nurses, sparking a renewal of interest in her life and work. Her admirers include Country Joe of Country Joe and the Fish, who has assembled an extensive website in her honour. The Agostino Gemelli Medical School in Rome, the first university-based hospital in Italy and one of its most respected medical centres, honoured Nightingale’s contribution to the nursing profession by giving the name “Bedside Florence” to a wireless computer system it developed to assist nursing. In 1912 the International Committee of the Red Cross instituted the Florence Nightingale Medal, awarded every two years to nurses or nursing aides for outstanding service. Four hospitals in Istanbul are named after Nightingale: F. N. Hastanesi in Şişli (the biggest private hospital in Turkey), Metropolitan F.N. Hastanesi in Gayrettepe, Avrupa F.N. Hastanesi in Mecidiyeköy, and Kızıltoprak F.N. Hastanesi in Kadiköy, all belonging to the Turkish Cardiology Foundation. An appeal is being considered for the former Derbyshire Royal Infirmary hospital in Derby, England to be named after Nightingale. The suggested new name will be either Nightingale Community Hospital or Florence Nightingale Community Hospital. The area in which the hospital lies in Derby has recently been referred to as the “Nightingale Quarter”. A statue of Florence Nightingale stands in Waterloo Place, Westminster, London, just off The Mall. There are three statues of Florence Nightingale in Derby — one outside the London Road Community Hospital formerly known as the Derbyshire Royal Infirmary, one in St. Peter’s Street, and one above the Nightingale-Macmillan Continuing Care Unit opposite the Derby Royal Infirmary. A public house named after her stands close to the Derby Royal Infirmary. The Nightingale-Macmillan continuing care unit is now at the Royal Derby Hospital, formerly known as The City Hospital, Derby. A remarkable stained glass window was commissioned for inclusion in the Derbyshire Royal Infirmary chapel in the late 1950s. When the chapel was later demolished the window was removed, stored and replaced in the new replacement chapel. At the closure of the DRI the window was again removed and stored. In October 2010, £6,000 was raised by friends of the window and St Peters Church to reposition the window in St Peters Church, Derby. The remarkable work features nine panels, of the original ten, depicting scenes of hospital life, Derby townscapes and Florence Nightingale herself. Some of the work was damaged and the tenth panel was dismantled for the glass to be used in repair of the remaining panels. All the figures, who are said to be modelled on prominent Derby town figures of the early sixties, surround and praise a central pane of the triumphant Christ. A nurse who posed for the top right panel in 1959 attended the rededication service in October 2010. The Florence Nightingale Museum at St Thomas’ Hospital in London reopened in May 2010 in time for the centenary of Nightingale’s death. Another museum devoted to her is at her sister’s family home, Claydon House, now a property of the National Trust. Upon the centenary of Nightingale’s death in 2010, and to commemorate her connection with Malvern, the Malvern Museum held a Florence Nightingale exhibit with a school poster competition to promote some events. In Istanbul, the northernmost tower of the Selimiye Barracks building is now a Florence Nightingale Museum. and in several of its rooms, relics and reproductions relevant to Florence Nightingale and her nurses are on exhibition. When Nightingale moved on to the Crimea itself in May 1855, she often travelled on horseback to make hospital inspections. She later transferred to a mule cart and was reported to have escaped serious injury when the cart was toppled in an accident. Following this episode, she used a solid Russian-built carriage, with a waterproof hood and curtains. The carriage was returned to England by Alexis Soyer after the war and subsequently given to the Nightingale training school for nurses. The carriage was damaged when the hospital was bombed by Nazi Germany during the Second World War. It was later restored and transferred to the Army Medical Services Museum in Mytchett, Surrey, near Aldershot. The recording is available online. The first theatrical representation of Nightingale was Reginald Berkeley in his “The Lady with the Lamp”, premiering in London in 1929 with Edith Evans in the title role. It did not portray her as an entirely sympathetic character and draws much characterisation from Lytton Strachey’s biography of her in Eminent Victorians. It was adapted as a film of the same name in 1951. In 2009, a stage musical play representation of Nightingale was produced by the Association of Nursing Service Administrators of the Philippines (ANSAP), entitled “The Voyage of the Lass”. The play depicts the story of love and vocation on the nursing communities’ icon Florence Nightingale, shown on all Fridays of February 2009 at the AFP Theatre, Camp Crame, Philippines. The play tells the story of Nightingale’s early life and her struggles during the Crimean War. “The Voyage of the Lass” was a two-hour play that showcased Philippine local registered nurses from various hospitals of the country, exposing their talents on the performing arts. Portrayals of Nightingale on television, in documentary as in fiction, vary – the BBC’s 2008 Florence Nightingale emphasised her independence and feeling of religious calling, but in Channel 4’s 2006 Mary Seacole: The Real Angel of the Crimea and Simon Schama’s A History of Britain she was portrayed as narrow-minded and opposed to Seacole’s efforts. In 1985 a TV biopic “Florence Nightingale”, starring Jaclyn Smith as Florence, was produced. In 1912 a biographical silent film titled The Victoria Cross starring Julia Swayne Gordon as Nightingale was produced. In 1915 another biographical silent film, Florence Nightingale, was produced starring Elisabeth Risdon. In 1936 a biographical film titled White Angel was produced, starring Kay Francis as Nightingale. In 1951 a second biographical film titled The Lady With the Lamp starred Anna Neagle. Florence Nightingale’s image appeared on the reverse of Series D £10 banknotes issued by the Bank of England from 1975 until 1994. As well as a standing portrait, she was depicted on the notes in a field hospital in the Crimea, holding her lamp. Nightingale had a principled objection to having photographs taken or her portrait painted. An extremely rare photograph of her, taken at Embley on a visit to her family home in May 1858, was discovered in 2006 and is now at the Florence Nightingale Museum in London. A black and white photograph of Florence Nightingale taken in about 1907 by Lizzie Caswall Smith at Nightingale’s London home in South Street, Park Lane, was auctioned on 19 November 2008 by Dreweatts auction house in Newbury, Berkshire, England, for £5,500. The first biography of Nightingale was published in England in 1855. In 1911 Edward Cook was authorised by Nightingale’s executors to write the official life, published in two volumes in 1913. Lytton Strachey based much of his chapter on Nightingale in Eminent Victorians on Cook, and Cecil Woodham-Smith relied heavily on Cook’s Life in her 1950 biography, though she did have access to new family material preserved at Claydon. In 2008 Mark Bostridge published a major new life of Nightingale, almost exclusively based on unpublished material from the Verney Collections at Claydon, and from archival documents from about 200 archives around the world, some of which had been published by Lynn McDonald in her projected sixteen-volume edition of the Collected Works of Florence Nightingale (2001 to date). Washington National Cathedral celebrates her accomplishments with a double-lancet stained glass window featuring six scenes from her life, designed by artist Joseph G. Reynolds. Beginning in 1968, the U.S. Air Force operated a fleet of 20 C-9A “Nightingale” aeromedical evacuation aircraft, based on the McDonnell Douglas DC-9 platform. The last of these planes was retired from service in 2005. In 1982 Sentara Healthcare inaugurated its medical helicopter service, officially named “Nightingale”. A KLM McDonnell-Douglas MD-11 (registration PH-KCD) also named after her honour. In 2002, Nightingale was ranked in the BBC’s list of the 100 Greatest Britons following a UK-wide vote. On 13 August 1910, at the age of 90, she died peacefully in her sleep in her room at 10 South Street, Mayfair, London. The offer of burial in Westminster Abbey was declined by her relatives and she is buried in the graveyard at St. Margaret Church in East Wellow, Hampshire. She left a large body of work, including several hundred notes which were previously unpublished.